Financiers, also called friands are little almond tea cakes originating from France. I already posted a recipe for them once here. Unlike Donna Hay’s recipe which I had used back then, this recipe doesn’t use baking powder at all. The cakes come out even more delicious. Soft, delicate, spongy, just wonderful!!! Traditionally, financiers are baked in oval or rectangular molds resembling bars of gold, but since I don’t have them (yet), I used other molds instead. The recipe comes from one of my favorite French food magazines Cuisine Gourmande. Use real butter (no margarine) in this recipe. Cooked until golden brown it will add a light nutty flavor to the cakes. 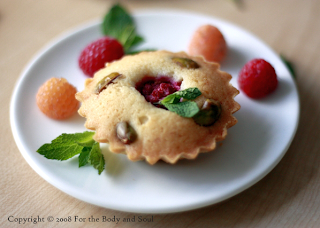 The raspberry - pistachio combination is truly delicious, but feel free to experiment with other fruit/nuts. The cakes taste delicious plain as well. 1. Preheat the oven to 350° F (180°C). Grease 12 friand molds or other molds you use. 2. Melt the butter in a saucepan; heat over low heat until it turns nutty brown and some of the milk solids separate. Leave to cool. 3. Sieve flour and icing sugar into a large bowl. Add almond meal and stir to combine. 4. Add egg whites, one at a time, stirring well after each addition. Add cooled butter and stir until the ingredients are well combined. 5. Spoon the batter into prepared molds. 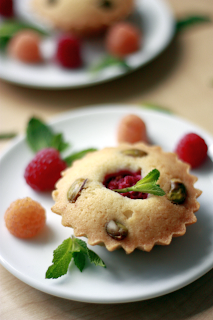 Press a few raspberries and pistachios into each cake. 6. Bake for 15-25 minutes or until golden brown. Let cool before unmolding. I love eating and making financiers and I love Cuisine Gourmande. I have my mom bring it to me when she comes visit. Gorgeous pictures! 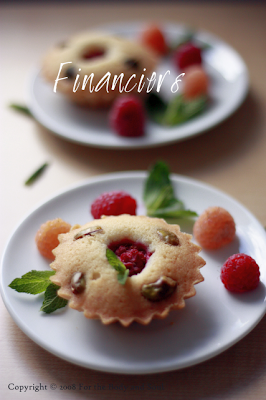 These little financiers are so cute ! These pictures are so pretty ! Financiers .... i love them!! Nice photos! Very pretty pictures! Will try these out soon.